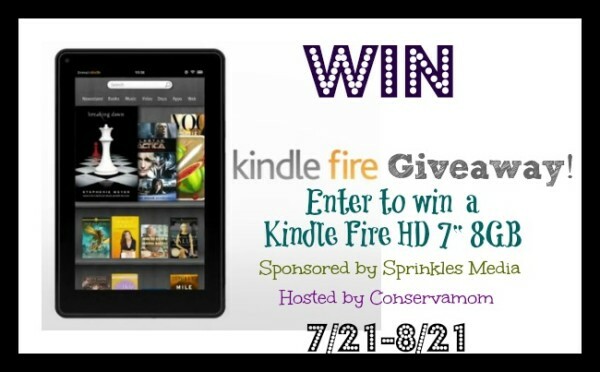 Home » Win a Kindle Fire HD 7″ 8GB Tablet – Great for everyone! I’d love to win a Kindle! My favorite thing would be to have my library of books to carry with me. I’m most excited about letting my mom read books on it. I want to read my first e book! I’m a book worm, so I’m excited about collecting ebooks. I would definitely be using my Kindle as a recipe guide in the kitchen. if i won, i would be super excited to read books on the kindle. i have always wanted a kindle. I’d be excited to give it to my son who is working on an important project. I am excited to download and read eBooks, especially through the library. Catching up on some long overdue reading! I would read books in bed!!! Read all my kindle books that I have bought. i’d love this to watch videos and listen to music! I would like to do giveaways and watch Netflix on it. I want to get this gift for my younger sister on her birthday because she loves to read and it will be the most worthwhile gift of her life. I would love to download and watch movies. I would love to catch up on some of the great books I have been missing out on! I’d love to play Angry Birds! It hits the middle ground between my phone and laptop. Very useful when I’m on the road. I want to download e books from my libary. I know I am silly to say this but read in the dark. I like to read at night while in bed. The Kindle I can read without having to put the light on. Getting the opportunity to read an eBook. I have to spend quite a bit of time in bed so it would be used for reading. Both work and pleasure! I will use it for school! i’ve looked at these at barnes n noble, awesomeeeeeee hopefully a winner! I am excited about reading books on a Kindle! I’ve never had a reading device so this is new and exciting! I can’t wait to download my favorite books and some books on my reading list. I would use it for reading, I love to read, any and everything! I am excited to read on it! Read! Maybe a little netflix. Netflix I would love that feature. I look forward to catching up on my Goodreads book list! I look forward to reading books while at work. I’m most excited to read Kindle books and play on the net. I Had A Kindle Fire & Somebody stole It!!! I Really miss The quality of Them & How clear, crisp & beautiful The screen was… I Really look forward to watching videos on It Again & Reading Books in Bed… Thank You!!! Give it to my husband. He will be so happy. He has used his Kindle so much it has scuff marks. Thanks for the chance to win. I would gift this to a friend who does a lot of traveling so she can read while she is away. Thank you for the great give-away. I would love to use fro reading books and magazines while traveling. This would be great for reading books when I’m away from home. If I were to get a Kindle Fire, the first thing I would do would be just to check out all the cool features. I’d be excited to read books on it. I would use it when I’m not at home for checking email, information, etc. Read the newest books and watch the current films. I’m most excited to be able to bring it along with me wherever I go so I can read whenever I get a moment. Read books of course! I also love the apps. I’m excited to read all my favorite books! I have a number of Kindle books stored @Amazon and have to have my laptop to look at them. I would love to be able to download them and have them be more accessible. I like being able to surf the web with it. Read a book. I love to read. I will read the books I have gotten for my kindle. I have been using a kindle app on my smartphone but I really want to be able to have my hands on a kindle for real! I want to be able to read the free books through my Amazon Prime subscription which requires a real Kindle instead of just the Kindle app. I am most excited to read ebooks!